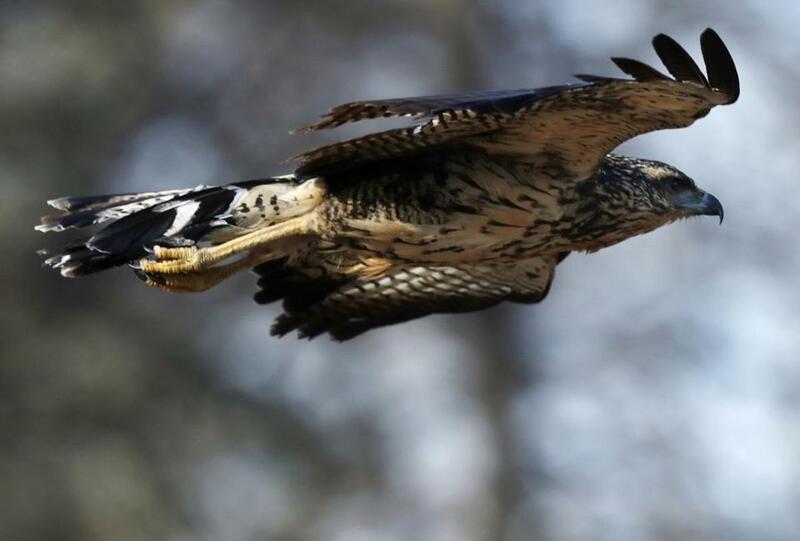 A great black hawk, a native of Central and South America, was in flight at Deering Oaks Park in Portland, Maine, on Friday. They say the early bird gets the worm, but it’s the rare bird that gets all the attention. Dozens of bird enthusiasts gathered in Deering Oaks Park in Portland, Maine, Thursday to get a glimpse of a Great Black Hawk, an elusive bird that had never been seen in the United States until earlier this year, according to a “Rare Bird Alert” posted to the Maine Audubon website. The Central and South American bird’s appearance in the park this week came nearly a month after it had last been seen Oct. 30, on the Eastern Promenade in Portland. Before that, the bird had been spotted in Biddeford in August, drawing hundreds of birders to Fortunes Rocks Beach. “This just keeps getting wilder,” Doug Hitchcox, the staff naturalist at Maine Audubon, wrote in the bird alert. The only other time a Great Black Hawk has been seen in the US was in April, when one was spotted on South Padre Island in Texas. Experts believe it may have been the same bird, which eventually made its way to the Northeast, according to Hitchcox. The hawk was pecking away at a gray squirrel Thursday from its perch in a Norway spruce tree. While its typical diet does include rodents, it tends to snack on reptiles, crabs, fish, and eggs when it’s in its native habitat. Despite its now altered diet, the bird appears to be healthy, Hitchcox said. The bird, which has brown and black body feathers and yellow legs, was still in the area of Deering Oaks Park Friday as of 9:25 a.m., according to live updates posted to the American Birding Association website. Audubon officials are urging birders to be respectful of the bird and to give it at least 200 feet of space if they decide to go check it out.